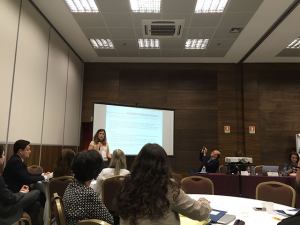 In collaboration with the Brazilian Special Secretary for Human Rights and the Ombudsman Office of Brazil, the Auschwitz Institute for Peace and Reconciliation (AIPR) organized a consultation meeting on November 30, 2016, in Brasília, Brazil on the project entitled “Education for the Prevention of Mass Atrocities”, which is being carried out under the banner of the Latin American Network for Genocide and Mass Atrocity Prevention. Representing AIPR, Dr. Clara Ramírez-Barat, Director of the Auschwitz Institute‘s Educational Policies Program, facilitated several modules during the daylong meeting, which was convened in order to introduce the project, to contextualize its objectives in relation to the state of human rights education in Brazil, and to develop strategies for the continued development of the project. Dr. Ramírez-Barat was accompanied by Dr. Deborah Duprat, Federal Ombudswoman, and Dr. Flavia Piovesán, Special Secretary on Human Rights of the Brazilian Federal Government. The project on education, human rights, and prevention was proposed by AIPR, through its nascent Educational Policies Program, to the Latin American Network member states in June of 2015 with the objective of designing a model for educational programming on mass atrocity prevention that is aimed at young people. Within the framework of the Latin American Network, the countries of El Salvador and Brazil were chosen as hosts to pilot the development of the program over a two-year period. The first consultation meeting was held in the city of San Salvador, El Salvador in July of 2016. Like the meeting in San Salvador, the agenda of the event on November 30 emphasized the exploratory aspect of this phase of the larger project. The Brasília meeting served to highlight the specific challenges and considerations presented by the Brazilian context. As the two components of the project will develop in parallel, each will continue to inform the development of the other country-specific material, as well as the project as a whole. While the diversity and richness of Brazil, a country with both a large population and vast geographic territory, presents a number of specific challenges to the project, it also represents a significant opportunity for the continued development of AIPR’s Educational Policy Program. 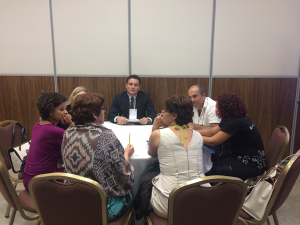 In particular, the Brasília meeting served to set up an ongoing dialogue among many different groups vital to the success of the project, namely educators, public institutions and civil society groups. This also included the attendance of international observers including those from the European Union Delegation in Brasilia, the Embassy of the Netherlands, and the United Nations International Children’s Emergency Fund. The November 30 meeting in Brasília was very successful in creating a space for engagement and fostering a productive discussion on the state of education in Brazil and the challenges that it must face in working to reinforce a culture of human rights and human rights values which will help prevent future violence. The contributions made by attending experts helped to solidify an informed landscape through which the group discussion segments could work towards concrete proposals. Equally, the presentation by 4 young Brazilian students on the scholastic challenges they face and the importance of education to the development of educated and empowered citizens was extremely inspiring. The next planned meeting for the project will take place in the spring of 2017 in Sao Paulo, Brazil. This meeting will look to engage with additional actors and hear from new voices, especially those from the younger generation. Simultaneously, work in El Salvador will continue, specifically in relation to the continued development of a proposal for implementation in accordance with the outcomes of the July 2016 meeting in San Salvador.